Today io9 chatted with Jeph Loeb and Ed McGuinness about the upcoming miniseries Avengers: X-Sanction, a four-issue limited series starring the cybernetic X-Man Cable as he cheats death to wage war against the Avengers. Expect plenty of punching and explosions — as McGuinness noted, "I have yet to find a gun too big for Cable." It's fair to say that X-Sanction is the overture to the next cycle of stories that we're doing [...] that will play out all until 2012. We're putting those plans together and keying all of that stuff up and getting it all ready. X-Sanction is sort of the starting gun or opening flare as we head toward these things that are on the horizon. I was on the book for three years and spent a lot of time dealing with Nathan and who he is. I always say Cable very much as the Captain America of the X-Men universe. He was a soldier who came out of time who cared deeply for the people he took care of. The men in the field were basically his family. Loeb mentioned that in X-Sanction, we'll learn what happened to Cable after his apparent death and what's drawn him into this unnamed conflict with the Avengers. X-Men fans will remember that Cable is the foster dad of the mutant messiah Hope. According to Loeb, Cable is "a father out to protect his daughter by any means necessary," and his relationship with Hope will put the Avengers squarely in his sights. 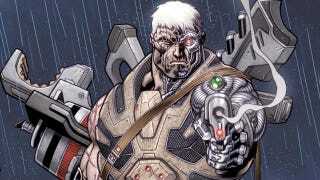 Additionally, Cable's actions will force leaders in the X-Men community to intervene — in fact, Cable's actions may create his own schism among the already fractured X-Men, who've recently pledged their allegiances to either Wolverine or Cyclops. According to the creative team, one of X-Sanction's strongest narrative hooks was that the reader will see Cable go against a group of people we don't see him normally associate with. For example, Loeb plans on playing up his similarities with Tony Stark — Tony's a futurist, Cable's a man from the future, Tony and Cable both have lived as bio-organic machines, etc. Finally, Marvel also guaranteed that "loaded for bear" with particular weapons that would prevent the Avengers from dog-piling him. Loeb wouldn't divulge what sort of armaments Cable would wield, but I'm guessing he's stockpiling witty repartees to outclass Spider-Man and pants-eating bacteria to shame the Hulk. We'll find out how Cable whups their bums when Avengers: X-Sanction is in shops this December.